Researcher’s Travel Grant: a new photo from one of our February winners! You are here: Home / News / Researcher’s Travel Grant: a new photo from one of our February winners! Here is a photo sent by Marijke who is just back from the 5th International Meeting on Angiogenesis in Amsterdam. She sent us this little email about this congress. 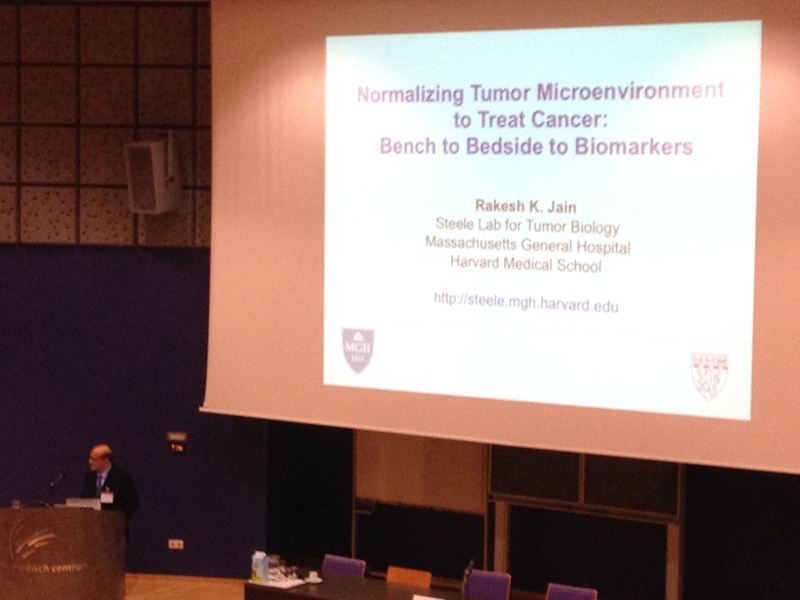 “Attached you will find an impression of the Key Note speaker Prof. R. Jain, who talked about “Normalizing tumor blood vessels to treat cancer”. This was a great lecture! Also I included a picture of myself standing next to my poster. There was quite some interest in my work, which was great! I had some nice discussions with other scientists, which might result in new collaborations. Also I now have some ideas for future research concerning platelets and cancer. So, thank you for awarding me with this grant! Thanks for Marijke for her impress!